Since moving back to L.A., Paul and I have been lucky with our housemates–they have been responsible and reliable and entertaining. But–and this is combined with all the “housekeeping” stuff referred to in my last post–given a new year and a new start, I’d like to try to improve my environment, and, because I don’t live alone, I need to figure out how to do that in conjunction with others. I’ve read that with the recent economic downturn, adult kids are moving back in with their families. I think, especially in high-rent urban centers–more people are also sharing their habitations with people who are NOT their families. More people are getting housemates (or as the Brits say, more accurately, “flatmates.”) Even before the economy became dire, most of my friends shared apartments after graduation and for most of their 20s. 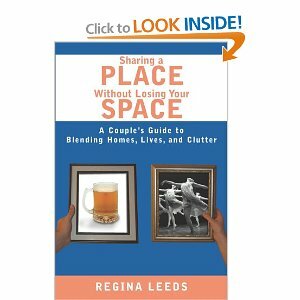 I did finally settle on this book: Sharing Your Place Without Losing Your Space. It is also aimed at couples, but it looked like some of the advice might apply–and of course, I am part of a couple. And to be upfront, our differing views on cleaning and clutter have, over the years, caused some of the deepest riffs in our generally good relationship, and any housemate we have has to integrate into that, which is a good reason to spend our roommate-free month trying to see how much of that we can resolve. Does anybody out there have reading recommendations, advice or opinions based on experience about how to create a happy, companionable, shared household with one or more other persons? I’m all ears! Previous Previous post: Change ALL The Things!